The marvellous superyacht Hetairos was relaunched a few days ago after a refit started in October 2010 at Southampton Yacht Services. Hetairos is a 42.84m ketch built by Abeking & Rasmussen in 1993. Constructed in mahogany and teak, her classic lines come from Bruce King and her timeless interior is by Andrew Winch. The refit composed of a full maintenance of the 6.5 ton bronze centreboard, but also encompassed the rudder, winches, windlass, main engine, shaft, propeller and so on. 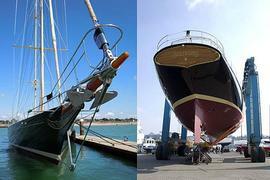 The sailing yacht had also a full paint job. Now Hetairos is ready for another Summer season in the Mediterranean. Note that she's currently for sale as reported in our brokerage news on 31 August 2010.